Licorice has been used for thousands of years as a natural remedy though most people know it for its sweet flavor. Licorice can be used to treat a variety of illnesses ranging from the common cold to liver disease because of its demulcent, soothing, coating and expectorant properties (Ehrlich). 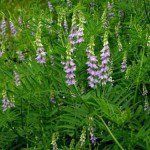 Research has found that Deglycyrrhizinated licorice (DGL) can be possibly used to treat stomach ulcers (Ehrlch). Licorice provides relief to ulcers by calming the muscle spasms in the stomach and increasing blood flow which facilitates the healing process (Almond). Licorice acts as a demulcent to soothe raw and inflamed tissues (Almond) which helps to treat coughs, colds, congestion, and sore throats. Licorice also clears excess mucus from the respiratory system by acting as an expectorant. Research has shown that gargling 4 times per day with DGL can provide pain relief from canker sores. This occurs because licorice boosts the immune system and helps to fight the herpes simplex virus (Almond). Licorice has no known side effects. Almond, Heidi. “Black Licorice Health Benefits.” . Livestrong, 03/05/2011. Web. 9 Jul 2012. Ehrlich, Steven. “Licorice.” . University of Maryland Medical Center, 01/12/2012. Web. 9 Jul 2012. “Licorice.” . Memorial Sloan Kettering, 16/08/2011. Web. 9 Jul 2012. Wiley, Suzanne. “Licorice Toxicity & Side Effects.” . Livestrong, 06/12/2011. Web. 9 Jul 2012.